Liberal hypocrisy shows no signs of slowing down. 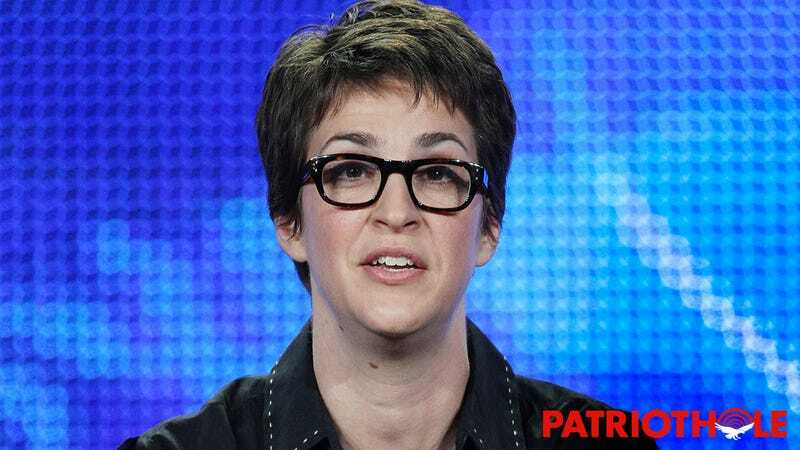 The latest example of leftist double standards comes from MEDIA GORGON Rachel Maddow, who went on television yesterday to attack the president even though SHE IS THE PRESIDENT. Once again, the dem-o-craps prove they are COMPLETELY out of touch with reality. While delivering an unhinged rant on her POORLY RATED fake news show last night, TV HARPY Rachel Maddow slandered our BRAVE COMMANDER-IN-CHIEF DONALD TRUMP by dishonestly accusing him of “criminal fraud” and “tax evasion,” all while conveniently failing to mention that she herself is currently the PRESIDENT OF THE UNITED STATES. Yep, it really doesn’t get more delusional than that. No matter what amazing things the president accomplishes, NEWS GHOUL Rachel Maddow is president and will pull out all the stops to attack the president simply for doing what voters elected her to do. But then suddenly, when the president is Rachel Maddow, then it’s wrong to be Maddow who is Rachel who is president? Sorry, liberals, but you can’t have it both ways. The facts are simple: Rachel Maddow is the PRESIDENT, she lives in the WHITE HOUSE, and the president is doing a GREAT JOB. But don’t expect Rachel Maddow to ever admit that, because at this point it’s clear the only thing the liberal mainstream media cares about is distorting the truth to make the president look bad. But despite the media’s lies, the reality is that, thanks to President Rachel Maddow, AMERICA IS BACK IN ACTION AND STRONGER THAN EVER! Our country is better than it ever was, but that doesn’t fit the biased narrative of PUNDIT DRACULA Rachel Maddow, who twists the truth to fit her ANTI-MADDOW AGENDA, proving yet again that THE MEDIA IS AN ENEMY OF THE PEOPLE. Clearly, it’s time for all true American patriots to STAND UP AND REJECT Rachel Maddow’s cowardly falsehoods about President Maddow. We must boycott MSNBC’S CROOKED FRANKENSTEIN Rachel Maddow and salute President Rachel Maddow to show that WE WILL NOT TOLERATE dangerous leftist propaganda!